Image caption Malawi's President Peter Mutharika initially called the claims "fake news"
There have been mounting calls for the resignation of Malawi's President Peter Mutharika after a leaked report by the country's anti-graft agency accused him of receiving a kickback from a 2.8bn kwacha ($3.9m; £2.8m) contract to supply food to the police. The president's spokesperson said the claims were "unfounded" and that Mr Mutharika had done nothing wrong. Civil rights organisations have nonetheless given him 14 days to resign, or say they will take to the streets. The report alleges that the head of finance of Malawi's police, Innocent Bottomani, and Mr Karim had "connived" to award Pioneer Investment a contract to provide 500,000 food ration packs. Days after the contract was signed, Pioneer Investment allegedly asked for a change to the agreed price from 2.3bn kwacha to nearly 2.8bn - the report says the change was fraudulently approved by Mr Bottomani. That is unclear. The president initially called the report "fake news" and a ploy by his detractors to scupper his chances at next year's elections. "I did not personally benefit in any way from the contract and that's why I am concerned about the lack of truth. I am worried about what our country has become in as far as peddling of fake news on social media is concerned," President Mutharika told Reuters. His office later acknowledged the existence of the DPP bank account on 1 July, telling the Malawi newspaper The Daily Times that the account was set up only to support the party's fundraising activities. 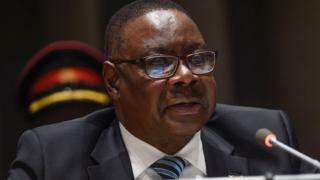 President Mutharika has been defiant in the face of mounting criticism. He told a DPP party congress that he was not running for "personal gain". "I only get 40% from my [monthly] salary of 2.7 million kwacha and the rest goes to government." Former President Joyce Banda has also weighed in on the issue of the president's political future. "When a president is not involved [in] looting or shady deals he or she does not hesitate to instruct arrests of those involved... he should therefore respond to Malawians' call to step down," she told AFP news agency on 3 July.